R|60} Study of copper pot and horn mug. W. Hunt. Standard example of colour-execution on objects more or less rustic and picturesque, yet having great R. subtlety in some parts, as, for instance, here the edge of the horn-mug. There is scarcely any difference between this and the finest Venetian execution, except that the Venetian, being almost invariably of beautiful things, is itself always graceful and beautiful to the utmost degree. 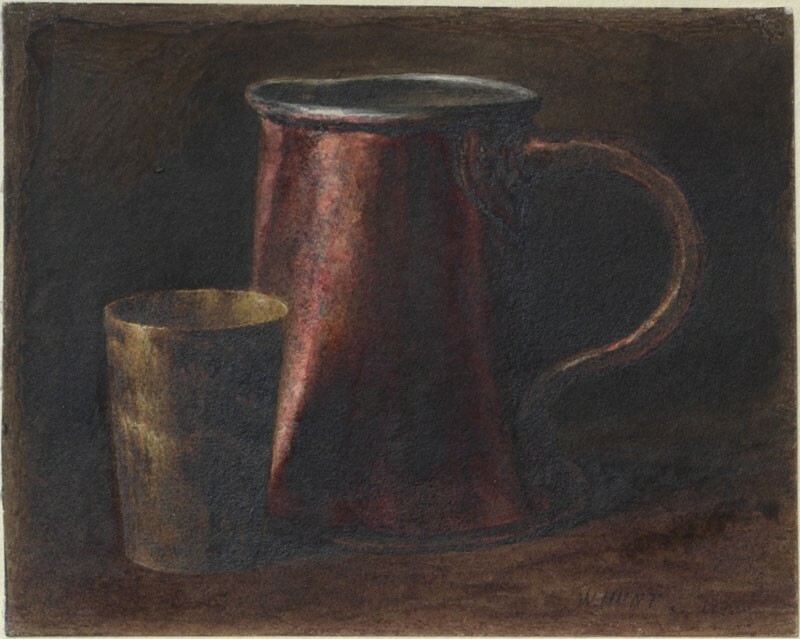 For instance, had the rim of the mug been of silver instead of pewter, Hunt’s execution would have become a little more delicate; but as in England our powers of enjoyment are more rustic than refined - so that we may any day produce a Bewick, a Gainsborough, or a William Hunt, but have little chance of producing a Filippo Lippi - the manner of execution in this drawing is that for the most part best adapted to the national temper which, if compelled to be refined, nearly always becomes mechanical.